Approximately two years ago, I wanted to add external link on YouTube, but I failed, or there wasn’t a feature to do this yet. 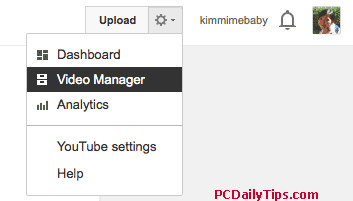 I also posted alpha channel tips and another new feature on YouTube here, visit and read if you have time for it. Now, you can add your website link as an external link with “Associated Website” feature if you have a YouTube channel in a good standing, and is already verified. Read this info from Google page. Also, the website link that you will use, has to be verified in Google webmaster tools. 1. Log in to YouTube channel. 2. In your browser, type: youtube.com/advanced_settings, hit enter. 3. Scroll down a bit, and you will see “Associated Website” section as shown in the picture below. 4. 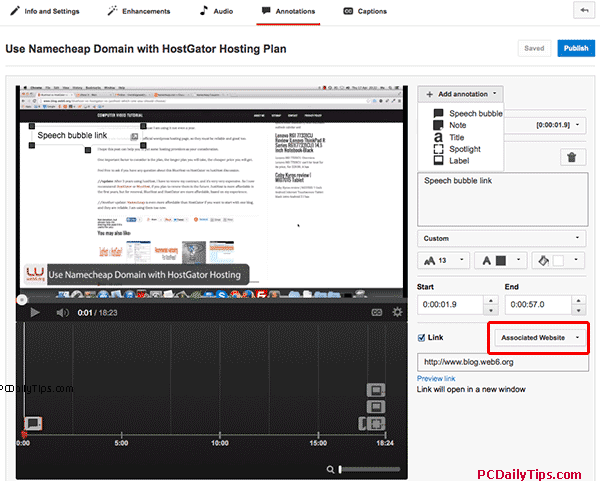 Type your site URL, completed with http in the box, so for example, https://www.pcdailytips.com, replace the pcdailytips.com with your domain. 5. If you website is already verified on Google’s webmaster tools, then it will say, “success”. How to use the External Link on YouTube? Once you’re successfully adding your website’s URL in the Associated Website feature, you can add it to any of your Videos with Annotation. This will redirect you automatically to your video manager, so you can choose any to your uploaded video, or just upload new video. In this demo, I use the uploaded video, so I can select the video, then click “Edit” button, select on “Annotations”. 2. 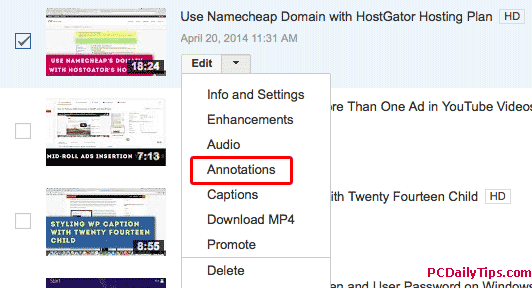 In Annotations page, make sure you are on Annotations (the tab will be red underlined). 3. Before adding annotation for associated website for the first time, you will see a link that say, “Enable your account for external annotation links” text, and the “Enable” button, click the Enable button. Read the Terms and Conditions, and click “I Accept”. “My website link, click!” customize the color, font size, Start and End time if you like. Once you’re done with customizing, check on “link” on the drop down menu on the right, select “Associated Website”, and add your website link we added above, in the box. Just hit publish from the step 3 above. Then, what I have done to fix this “Please enter a valid URL” on YouTube was, log out from my account, and clean my browser’s cache, and login again, and repeat the steps above, it worked! Let me know how you fixed it too if you have the same error.